Target Shotgun, an N.R.A. recognised shooting discipline involves shooting with Multi-Shot Semi-Automatic and Pump Action shotguns, both high and low capacity and Double Barrelled and Single Shot Shotguns. The targets can be of several different types including Paper, Reactive Steel, Clays and Bowling Pins and are usually static. 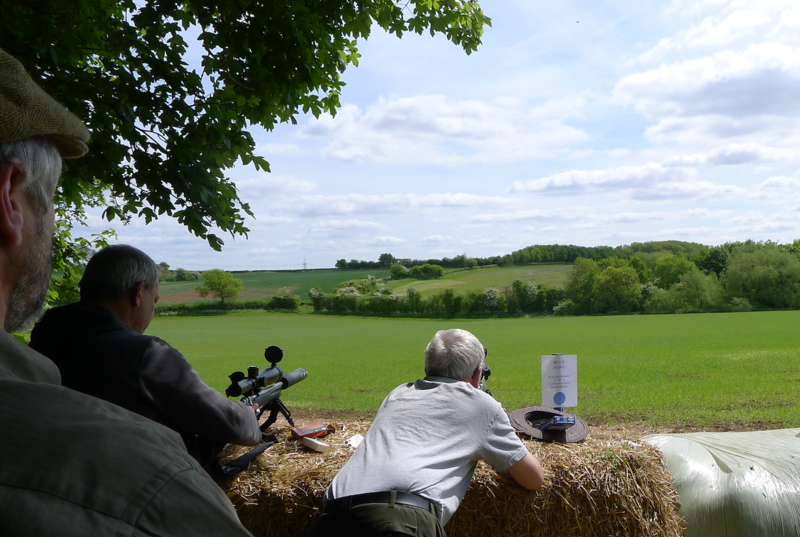 The easiest way to describe target Shotgun is that it is everything that Clay Shooting isn’t, in that we usually shoot at static targets at ground level or just above with considerable use made of Solid Slug Ammunition. Timed & Precision This is shot from ranges of 30 yards to 15 yards on a single turning paper target per competitor using 30 rounds of solid slug ammunition only, from the standing position within fixed times. 30 yards 12 rounds total, all fired in 2 minutes (120 seconds). 20 yards 12 rounds total, 1 shot on each 2 second exposure x 12 (time is allowed for a reload after 6 rounds fired). 15 yards 6 rounds total, 2 shots on each 3 second exposure x 6. Multi-Target This is shot from ranges of 30 yards to 15 yards on 2 turning paper targets per competitor using 24 rounds of solid slug ammunition only from the standing position, within fixed times. 30 yards 6 rounds total, all fired on the Left target in 15 seconds. 25 yards 6 rounds total, 3 rounds on each target in 10 seconds. 20 yards 6 rounds total, 2 rounds on the Right target on each 3 second exposure x 3. 15 yards 6 rounds total, 3 rounds on each target in 8 seconds. Embassy Cup This is shot from ranges of 25 yards to 15 yards on 2 turning paper targets using 24 rounds of solid slug ammunition only, from the standing, prone, kneeling and seated positions within fixed times. 25 metres 8 rounds total, 2 rounds on each target standing, reload 2 rounds on each target prone in 20 seconds. 20 metres 8 rounds total, 2 rounds on each target standing, reload 2 rounds on each target sitting in 20 seconds. 15 metres 8 rounds total, 2 rounds on each target standing, reload 2 rounds on each target kneeling in 20 seconds. T.B.T. Is shot on multiple, differing courses of fire, targets, distances and positions from 5 to 50 metres, timed to the last shot fired using, buckshot or solid slug ammunition. It can involve movement, but either without a gun or with an unloaded gun. This is essentially Practical Shotgun without complete freedom of movement. 100 & 200 Yards Is shot at 100 and 200 yards on paper targets using solid slug ammunition only from the standing and sitting or kneeling positions within fixed times. The Bowling Pins are set up as in Ten Pin bowling at a Bowling Alley at 25 to 30 yards and then shot with two rounds only of Solid Slug ammunition on each individually scored run. There can be from one to ten runs. Snooker is shot on twelve reactive steel targets with birdshot. One set of six plates are painted to represent the coloured balls on a Snooker Table and are set at progressively longer ranges from the Yellow to Black and one six set of plates are painted to represent the red balls and are set at close range. The competitor starts with an empty gun and has 20 seconds to shoot the plates in order i.e. red followed by a colour, followed by a red etc., the plates are scored as their colour values in Snooker. All of these courses of fire, for shotgun originated, in the U.K. except Embassy Cup. Several are derived from Police Pistol and Service Pistol courses of fire. More courses of fire are being created and imported from other countries as we go along. The National Rifle Association runs at least four events each year where target shotgun is shot mainly, Timed and Precision, Multi-Target and Embassy Cup. They also run two events where T.B.T. is shot usually with one of the Small Shoots. Although normal Side by Side, Over and Under and Low Capacity (Three round) Semi-Automatic and Pump Action Shotguns can be loaned the users must have the relevant competency signed off on their N.R.A. competency card. Note, Section 1 (Firearms Act 1968) Shotguns (Semi-Automatic or Pump Action Shotguns with a capacity over Three Rounds) cannot be loaned. Eye and Ear Protection is mandatory at all of these events.